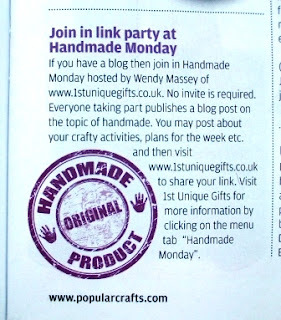 If you'd like to join in with your craft blog, you'll find more info here. This week, as you may already know, started out with a mini-catastrophe when my hard drive crashed. Pretty dreadful stuff, especially for someone like me who is so-oo bad at backing stuff up - fortunately I didn't lose much (apart from sleep, time and a little money funding a new hard drive!) but it definitely taught me a lesson! I'm now backing everything up at Just Cloud - after the initial downloading it backs up atomatically every day for me, which is just amazing as I don't need to think or worry about it. It means I can access it anywhere, too, and it doesn't take up any space. If you sign up for it using this link I get some free storage space, apparently, but I do have bucketloads of space to use anyway. If you don't use cloud storage, make sure you do back up. 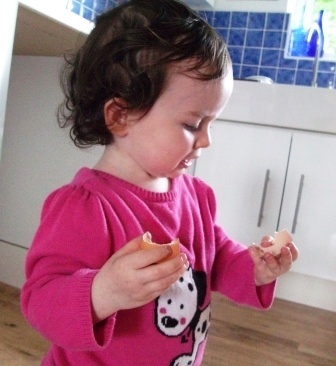 My granddaughter Emily is fascinated by eggs (she plays with some wooden turned eggs at my house, plus she loves to collect eggs from the chicken coop - she loves the chickens, too). Last week, she watched me break an egg and then tried - very carefully - to put the shell back together again! well, it just won't fix, will it? 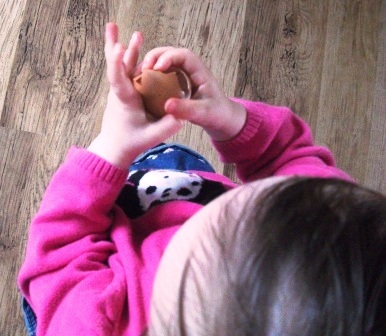 She gave up in the end - but she wasn't happy about the idea of putting it in the bin! 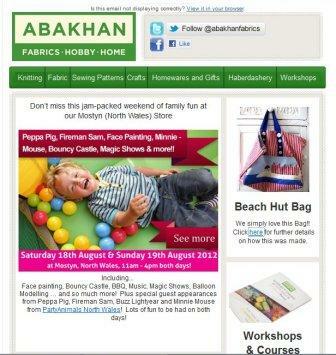 In other news this week, it was lovely to discover that Abakhan had linked to my beach huts bag on their email newsletter! It was also nice to discover that Popular Crafts had mentioned Handmade Monday in their magazine! Unfortunately, the link was to my website, where most people probably just got lost and gave up, as there's no mention of Handmade Monday there. Ah well, it's always nice to have a mention (and I did get a lot of people visiting my website)! Perhaps I should email the editor and maybe we'll get another mention! I've not managed to get much done on the sewing front this week, but I have two deadlines looming so my sewing machine will be whirring into action very soon. There's a couple of upcycling commissions on the horizon, too, which is quite exciting! Over to you - and this week I'm hoping no disasters prevent me from enjoying a good mooch around your blogs. I love children when they are like this. You can see their minds working. Really moments to treasure. I am glad that you got things sorted out. I hope that you have a good week. I do sympathise with you regarding your computer - having been through something similar about 18 months ago, I now how frustrating it is, especially when it costs money. 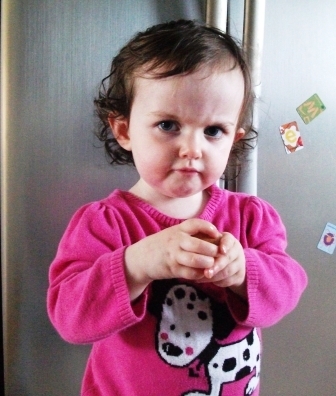 I love the look on your granddaughter's face in the first pic - real determination to fix it. Well done with the Abakhan link and also that Popular Crafts mentioned Handmade Monday - they are very supportive of all crafters. Hope you have a good week. Glad I got a savvy DH who I throw my computer at if it goes wrong! Your little g'daughter is such a cutie. Nice to be mentioned in the magazine. I would email them and tell them about your other blog. I would email the magazine again you never know, you may get another mention! Love the pictures of your granddaughter, wouldn't it be lovely to find such simple things so fascinating again!!! Here's to a better IT week! Must have been the week for computer crashes, we had the same only this was DH's. We now have a time capsule that back's up every hour brilliant. poor you with your hard drive catastrophe! i'm glad you didn't loose too much stuff in the end. This happened to me once and i lost loads of things - that's when i got an external hard drive (which is pretty much invincible apparently and backs up everything automatically) the only problem being that the wire that connects it to my computer is far from invincible and has been completely chewed through by the dog! I will follow your link and check out 'just cloud' - sounds like it could be the answer! Personally I don't really trust cloud backups. Having all my data, work and information held somewhere far, far away by someone else's computer just not fill me with coinfidence. I prefer to use an external hard drive to backup my information. Stephen - thanks for pointing out the lack of title! It wouldn't have mattered if HM hadn't moved house - the mention goes to the website and not the blog (if it had mentioned the blog, the links are all there). Ah well, I guess it's an easy mistake - the URL's are similar. Your grandaughter made me laugh.What is it about eggs?My son used to sit on them to try and hatch them!I went past Abakhan on the bus the other day-must go in and look at the fabric etc.Congratulations on the mention. 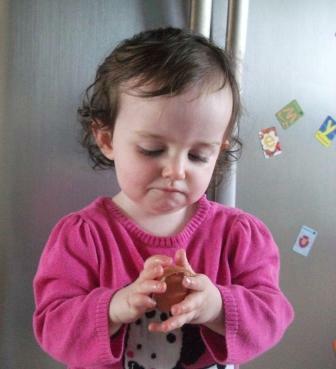 Daisy loves to go and collect our eggs too - she is fascinated when they are warm. What lovely photos. Well done with the couple of mentions! fingers crossed you have no more problems with your pc! Glad you got the computer thing fixed without losing it all. I've had a near miss myself and now have mine back up to a big hard drive in the back room wirelessly every hour. Maybe sounds like overkill, but it saves me from myself. Seems that everything is going well with you. I'm so glad to be back! I have some but not all of my things backed up, I need to get me an external hard drive. Glad you've now got yours all sorted. I don't think I'll get a chance to take part this week but I'll try and get around a few for a lookee see. Love the grandaughter pics, I usually crush my eggshells and place them around plants, they help keep the slugs and snails at bay. I tried that once, Jan, and the slugs just crawled straight over the eggshells and made a meal of the plants anyway. We must have tough slugs round these parts! I usually just put them in the compost now (the eggshells, not the slugs, although the slugs rather like compost, too). Sounds like a good week for promotion - even with all the gremlins! great news about having your computer back! there's nothing worse than your daily use equipment failing you unexpectedly. brrr... stressful and annoying. I hate when mine does that to me. I hate pc maintenance but it's a must and after every pc crash I promise myself I will be backing everything up... yeah, right... until the next crash happens and the story repeats itself. terrible, i am!